One of the biggest department stores in London is closing with the loss of 850 jobs. 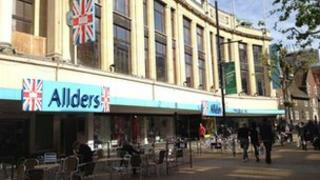 Allders has been open in Croydon since 1862 and became the flagship store of a chain across England. But it went into administration in June. When a buyer for the firm could not be found 22 September was announced as the last day of trading. Croydon Council said the stricken firm had been unable to raise enough working capital. Administrators Duff & Phelps said: "We recognise that the store is an historic and iconic landmark in the local community. Croydon Council leader Mike Fisher said: "We're tremendously sad. "It has been part of the town for a very long time. "Unfortunately, Allders has been unable to keep up with the competition in the modern retail market." Gavin Barwell, Conservative MP for Croydon Central, has called it a "heavy blow" for the town following the riots in Croydon last year and Nestle's decision to leave in January.